Ancient peoples’ attitudes towards, and relationships with, the natural environment and the landscape were often completely at odds from ours. Two fundamental concepts must be borne in mind, in particular. The first is that ancient man was a religious man, and the second is that religion was bound up with the natural cycles, and these natural cycles were bound up with power. We shall gradually gain more insight into these fundamental concepts as this book progresses, but it is essential to take account of them when engaged in fieldwork because they were reflected in the landscapes. Typically the monuments which are the object of study of archaeoastronomy are immersed in landscapes which were of special, sacred significance for the people who built them. 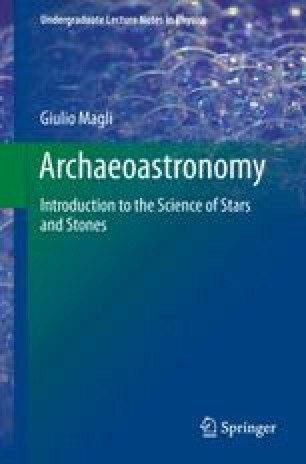 Therefore, the first step in any kind of archaeoastronomy fieldwork is to look around carefully, trying to understand how the ancient configuration of the surroundings might have been. This might be relatively easy if the environment has remained unspoilt or, on the contrary, depressingly difficult if humans have modified the landscape beyond recognition. Furthermore, we must try to imagine the landscape and the sky as a whole, since it is in this way that ancient people perceived the Cosmos around them. This may also be problematic, due to environmental pollution, light pollution, and—last but not least—precession. Fortunately, as we shall see in the next chapter, computers may be of enormous assistance in tackling these tasks through the use of virtual globes and planetarium software.